It is from these famous lines of William Butler Yeats’ “The Second Coming” that Gary Braver derives his title for this provocative novel. 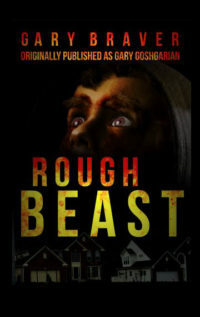 Rough Beast, set in a small town in Massachusetts, is a thriller in the tradition of Stephen King and Dean Koontz, combined with the scientific underpinnings of Michael Crichton. The elements of horror and suspense and intrigue reinforce one another in a many layered tale that ultimately brings the boundaries of nature into question. Gary Braver has crafted a novel that plumbs the depths of genetic engineering, a powerful force that can be used for good or evil. Rough Beast explores the consequences of a military experiment gone wrong and its effects on as normal, unsuspecting American family–especially on its twelve-year-old son, Matty. Rough Beast (Penguin, 1996/ Leisure Books, 1997), a biotech horror novel in the tradition of Dean Koontz and Michael Crichton.